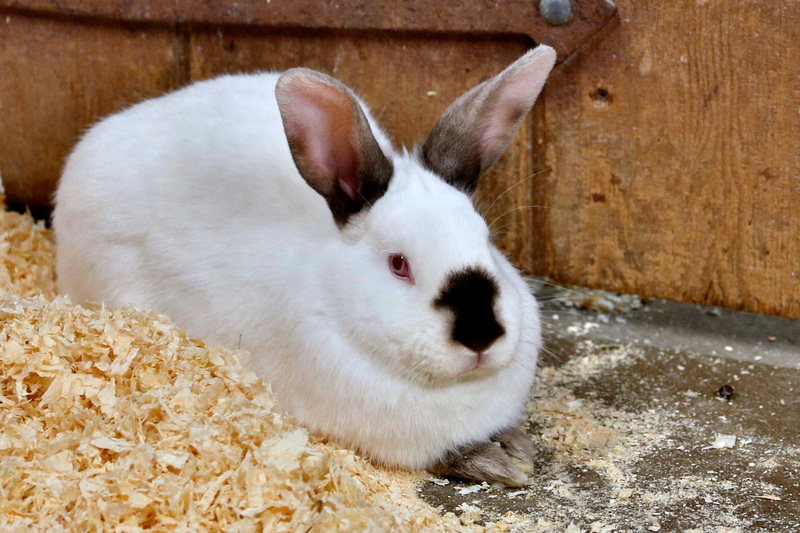 Domestic Rabbits may be visited in the barn of Connecticut’s Beardsley Zoo’s New England Farmyard area. They are most active at dawn and dusk. Their 28 teeth never stop growing. DESCRIPTION: Domestic Rabbits are small mammals. They are covered in fur, have whiskers, fluffy, short tails and long straight ears. They range in size from two to four pounds. The males, called bucks, are usually heavier and taller than the females. Their ears can grow as long as four inches and serve two purposes: one is hearing, obviously, so they can hear predators approaching; the other is to help them stay cool in the heat. Blood vessels in the ears dissipate excess body heat. 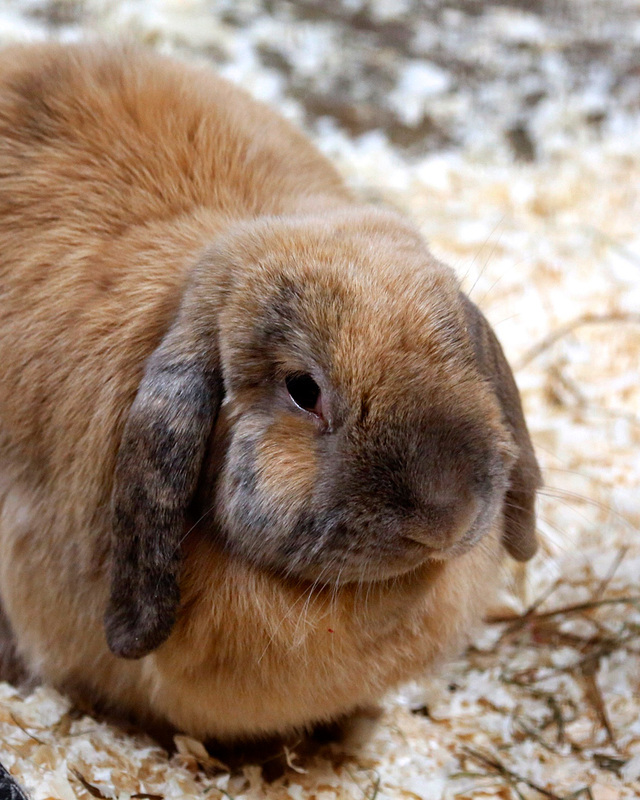 Domestic Rabbits can rotate their eyes 360 degrees so they can see behind them without turning their heads. They do have one tiny blind spot though. It is right in front of their noses. Domestic Rabbits dig large, complex burrow systems called warrens. They are sociable animals and live in large colonies in the warren. One colony typically consists of six to ten adults. Multiple colonies live within the warren. During a study, one rabbit warren contained 407 rabbits and had a total of 2,080 entrances! Domestic rabbits are different from their wild relatives. They do not tolerate extreme temperatures well. Domestic Rabbits are known to be meticulously clean and like domestic dogs and cats they can be taught to come when called, sit in your lap and do simple tricks. Unlike domestic cats and dogs, Domestic Rabbits do not have padding on their feet. Domestic Rabbits are natural runners and run in zigzag patterns to get away from predators at up to 18 miles per hour. They can jump up to 36 inches high. RANGE: More than half of the world’s Domestic Rabbits live in North America but they can call most places home as long as the environment is regulated so they do not suffer from heat exhaustion or hypothermia. HABITAT: They prefer dry areas near sea level with soil soft enough for burrowing. They can also be found in grassy fields or forests where there is ample coverage. FAMILY LIFE: The female rabbit, called a doe, makes an underground nest lined with straw, vegetation and fur from her underside. She will give birth to a litter of four to eight live babies, called kits up to eight times a year. Kits are blind at birth and have little fur. The doe does not spend a lot of time with the kits so she does not attract predators to the nest. She will feed them once or twice a day. The kits open their eyes at around 13 days old. Within three weeks they can leave the nest, eat solid food and drink water. At six weeks they no longer nurse. LIFE SPAN: If they survive the first year of life, the average life span is 5 years in the wild and up to 12 years in human care.